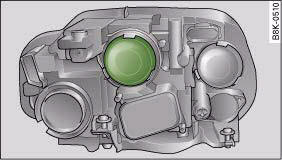 The description for removing the headlight refers to the left headlight; in principle the same procedure applies to the right headlight. – Take the screwdriver and the interchangeable Torx socket out of the vehicle tool kit. – Remove the screws, fig. 288 that secure the trim panel to the lock carrier and detach the trim panel. – Slacken the two screws that secure the headlight to the lock carrier and the two screws at the underside of the headlight (the screws at the underside should not be slackened more than five turns), fig. 289. – Carefully pull the headlight forward about 60 mm. – Release and unplug the electrical connector. – Carefully take the headlight out towards the front (swivel it slightly if necessary). – Perform all of the above steps in reverse sequence. 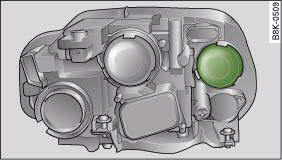 The headlight must be inserted in two guides (on the underside of the headlight). 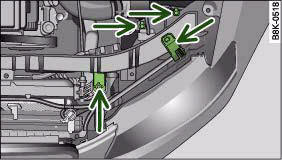 This is the only way to ensure that the headlight is installed in the correct position. 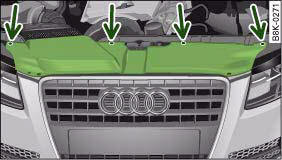 To determine whether the headlight is correctly installed, check that it is aligned flush with adjacent body parts (such as the wing panel). Do not interchange the securing screws. Please take particular care not to damage or scratch the adjacent parts of the body when removing or installing the headlights. – Take off the rubber cap ⇒ fig. 290 ⇒ in “Changing bulbs” on page 304. – Press the connector in the direction of the arrow ⇒ fig. 291. 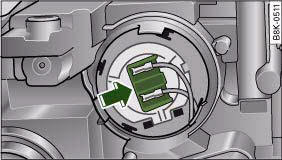 – Remove the connector together with the bulb from the headlight housing. – Disconnect the connector from the base of the bulb ⇒ in “Changing bulbs” on page 304. When installing a bulb, the lug on the base of the bulb must be inserted into the appropriate mounting on the bulb housing. – Attach the new bulb to the connector ⇒ in “Changing bulbs” on page 304. 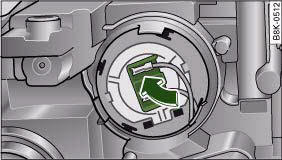 – Insert the bulb carefully into the bulb housing. Start by placing the base of the bulb directly behind one of the retaining hooks so that the lug fits into the recess on the bulb housing. – Press the connector in the direction of the arrow ⇒ fig. 293 until the bulb engages. 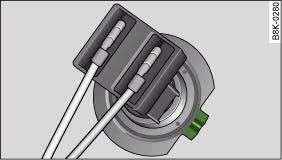 – Check that the bulb is securely seated in the bulb housing. – Fit the rubber cap and install the headlight. – Have the headlight settings checked. 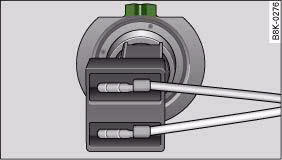 Ensure that the rubber cap is seated correctly so that no water can enter the unit. – Take off the cover, fig. 294 ⇒ in “Changing bulbs” on page 304. – Press the connector in the direction of the arrow ⇒ fig. 295. – Press the connector in the direction of the arrow, fig. 297 until the bulb engages.